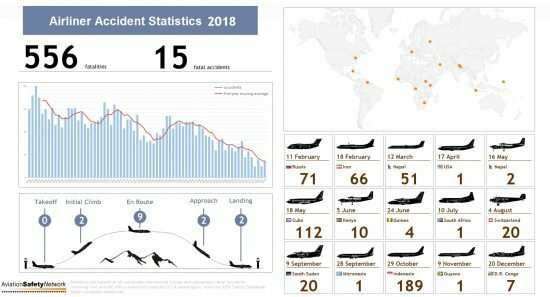 The Aviation Safety Network today released the 2018 airliner accident statistics showing a total of 15 fatal airliner accidents, resulting in 556 fatalities. Despite several high-profile accidents, the year 2018 was one of the safest years ever for commercial aviation, Aviation Safety Network data show. Yet, last year was worse than the five-year average. Over the year 2018, the Aviation Safety Network recorded a total of 15 fatal airliner accidents , resulting in 556 fatalities. This makes 2018 the third safest year ever by the number of fatal accidents and the ninth safest in terms of fatalities. The safest year in aviation history was 2017 with 10 accidents and 44 lives lost. Twelve accidents involved passenger flights, three were cargo flights. Three out of 15 accident airplanes were operated by airlines on the E.U. “blacklist”, up by two compared to 2017. Looking back at the past five years, one thing is clear: Loss of Control accidents are a major safety concern as this type of accident was responsible for at least ten of the 25 worst accidents. Most of those accidents were not survivable. Statistics are based on all worldwide fatal commercial aircraft accidents (passenger and cargo flights) involving civil aircraft of which the basic model has been certified for carrying 14 or more passengers. Consequently, the April 11 accident involving an Algerian Air Force IL-76 transport plane that killed 257 is not included. When including military transport aircraft the total number fatalities would be 917 in 25 fatal accidents.